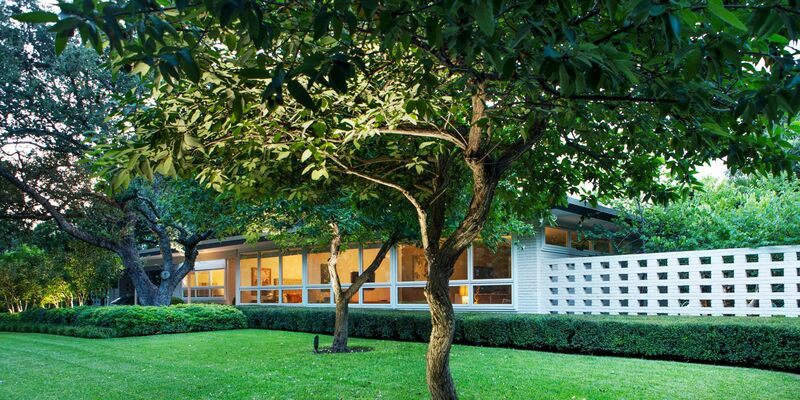 The revitalization of this 1954 estate complements renowned mid-century architect (and protege to O'Neill Ford) to Allison Peery’s original home design. 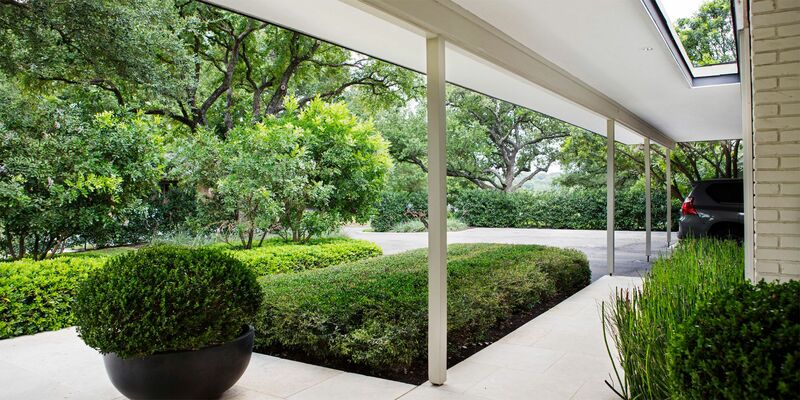 As one of Peery’s only residential projects, our client’s goal was to restore the house and surrounding gardens to its former splendor. 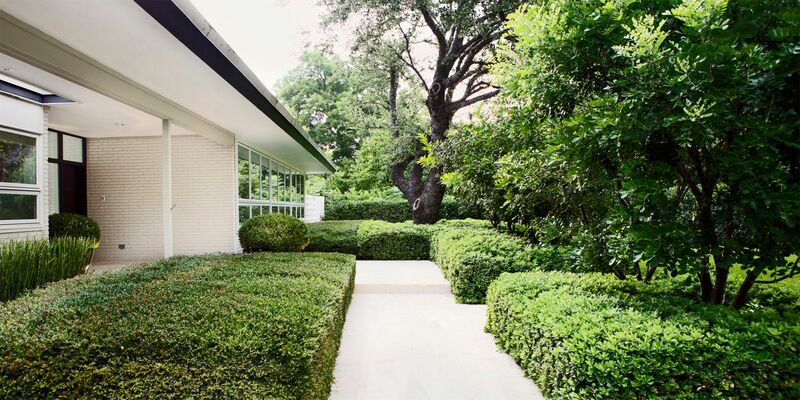 The renovated landscape exemplifies modern simplicity through the use of clean geometric lines that reflect the low-slung architectural roofline and massing. 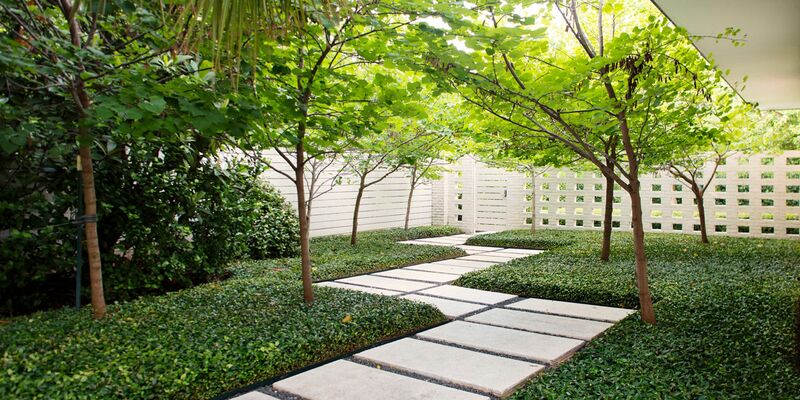 In the front yard, evergreen groundcover plants, hedges, and trees boldly define outdoor spaces, creating privacy from the street, while maximizing garden views from bedroom windows. Reconfiguration of the circular drive to a new auto court allows for a car-free arrival sequence from the street, leading visitors through layered garden spaces to the all-glass entry foyer, and helping blur the lines between inside and outside. 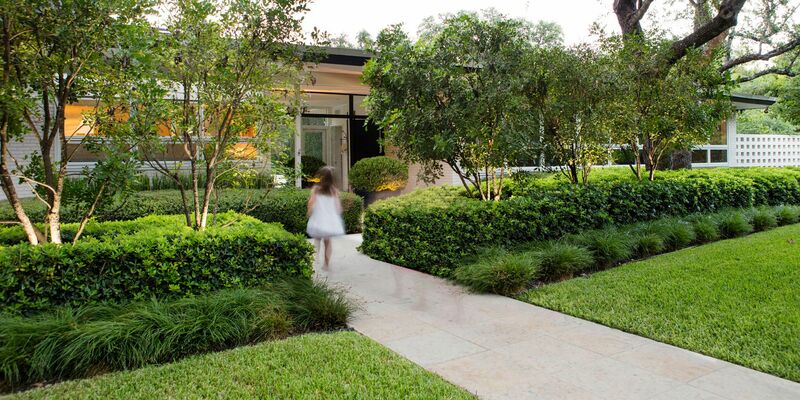 As one approaches the front door, a row of up-lit planters visually march through the indoors to the back yard, where the row of planters continue to the pool patio and backyard gardens. From the living room, large sliding glass doors open up to an extensive limestone patio, helping frame the celebrated kidney-shaped pool at the heart of the property. Extensive regrading of this area allows for improved drainage. New pathways throughout the backyard provide new garden connections and a stronger relationship to the historic pool house. During construction, the original white terrazzo pool deck was salvaged and re-purposed, creating stepping pads connecting two side courtyards that were once barren spaces. Flowering understory redbud trees provide seasonal interest, wildlife habitat, and much needed shade to the areas. Around the pool, transplanted palms original to the house were regrouped along with new specimen plantings, transforming the back yard into a lush oasis. Removal of a wall that once screened a hanging clothesline at the back of the property, provided for a new palm lined pathway to a vegetable garden and citrus orchard. 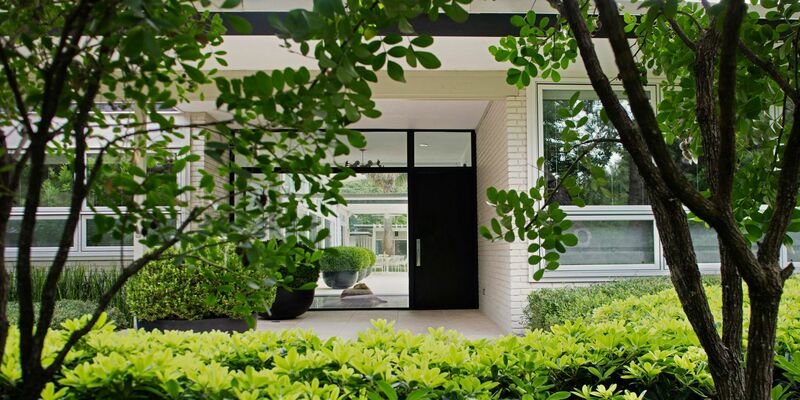 A horizontal white fence helps extends house’s bright and light style to the property lines, providing complete privacy for the client, allowing them to feel safe and secure as they enjoy the beautiful garden spaces from both inside and outside.